a) 2 Chamber Sash / 7 Chamber Outer Frame – more chambers, more resistance to thermal conductivity. This uPVC window frame profile has various customizations available. The above specifications are just a handful. There are many specifications which can be handy for all the trickiest customizations that a fabricator may need. According to these uPVC window frame profiles also have varied sizes and designs. They can be customized for any living space. They are designed with ventilation in mind. These uPVC profiles are lead-free and are premium made with precision NABL engineering. 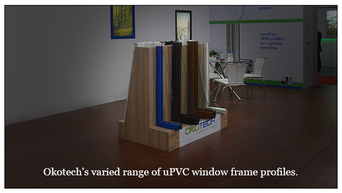 With such a wide range of uPVC window frame profiles, Okotech as a uPVC profile manufacturer is revolutionary. For additional information explore https://okotech.in/ .